Here’s a very special tote for a very special trip! Your child’s name is embroidered on the front of this boy's overnight bag—inside, there’s plenty of room for jammies, teddy bear, and more. Personalized tote bag features zippered pockets on top and side with two handle styles. Specify name; limit 12 letters/spaces. Vinyl. Tote is 17" long x 6" wide x 12 1/2" high. Too cute!! The name was embroidered and stood out!! It is very good looking and great colors for a young boy. My grandson loved it especially with his name embroidered on the side. Holds everything my grandson needs when his parents come over. My grandson loved his gift. Present for Grandson, when he receive wanted to come to Grandma's now. Great size. Very pleased with purchase. Much larger than I thought. I bought six, one for each greatgrand child, the kids will love them. 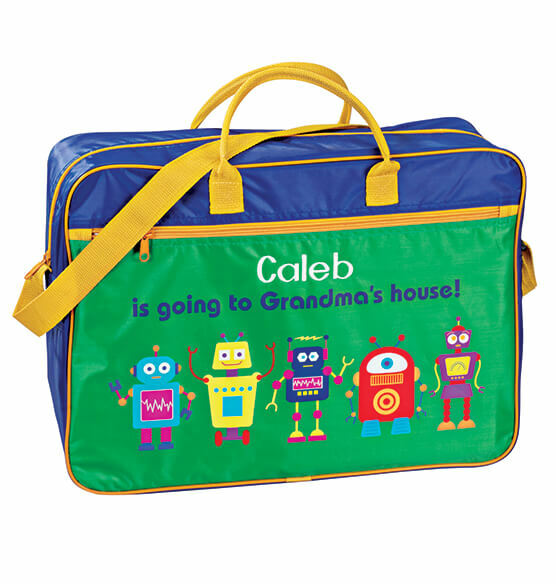 Absolutely cute bag for my grandson's visits! Colorful, roomy, soft-sided; he'll have lots of room for clothes and toys. Nice, large, outside zipper pocket. He's too small yet to carry it himself, but he's a determined little fellow...he'll drag it if necessary! Excellent quality- excellent value - my grandson loves it!! this was awesome, it was fun watching my grandson try to carry this around, and get up in the morning ready to get his bag to go to daycare. It also help the daycare workers, they love it. Love having the bag for my grandson but the vinal does not hold up with repeated use. I like the bag, although I can tell it won't hold up to heavy use. It's perfect for the occasional overnight trip to Grandma's, which is all we were looking for. One disappointment I will note was when I opened the mailer bag it arrived in, the adhesive strip that closed the mailer had been (inadvertently, I'm sure) affixed to the bag I ordered, which left a gummy residue on it that has been impossible to remove. So I'm a bit bummed that my son's brand new overnight bag is "dirty" right out of the packaging. If the product had been placed in a plastic inner bag to protect it during shipping (in case the shipping mailer got torn, etc.) this would not have happened. Hopefully Miles Kimball will remedy this for future orders.